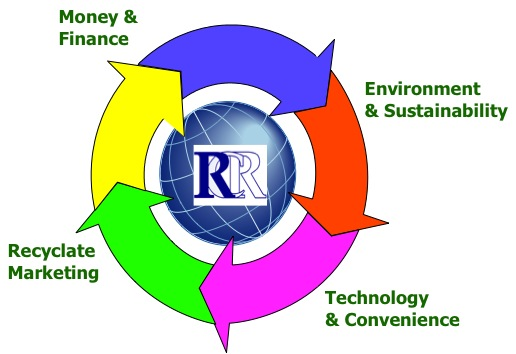 RCR is a global processor of Municipal Solid Waste (MSW) and takes unsorted waste, extracts the recyclables after treating it all with steam so they are size reduced and sanitized. These are treated on site for enhancement of value, then sold to smelters and end-users. The organic fraction comprises of paper, food, bones, nappies, green waste etc. Post treatment, the organic fraction is visibly similar to compost that is converted into ethanol and the residue from the enzymatic hydrolysis process is combusted in a steam raising boiler, as a carbon neutral fuel, to produce process steam that drives the autoclaves and also the steam turbine to produce green electricity. The RCR STAG process diverts 98% of all waste from landfill and incinerators and reduces greenhouse gasses by up to 20% and achieves a 100% passive public engagement in recycling activities leading to 98% of all recyclables being recovered and sold for reuse. Additionally RCR processes and deconstructs scrap tyres, re-refines used oil, handles and neutralizes hazardous wastes – including liquid industrial toxic waste (LITW), household hazardous wastes (HHW), and clinical and medical wastes. It comprises businesses engaged in the generation of renewable electricity from the fibre created from the organic fraction of MSW. Its production network spans process facilities in 103 countries throughout the world. Leading market positions allow RCR to be the supplier of choice for many of the largest customers in our markets. This has translated into strong and long-term relationships with these customers. The management philosophy at RCR is to operate a simple and decentralized organizational structure, coupled with programmes intended to incentivize our employees.